The newest ADF technology ensures excellent visibility, thanks to brilliant optical characteristics of the auto-darkening filter, while sensitivity control will be of great use for low-amperage welding. Scratches on a mat shell will be visible. 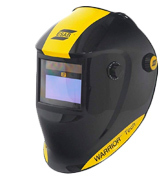 This lightweight modern ESAB welding mask will come in handy for various types of welding jobs. Fully adjustable, it will cause no discomfort even under long-term use. Four arc sensors significantly increase the filter response speed while the enlarged viewing angle allows for better operation control. 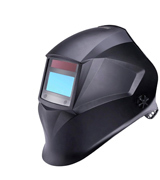 The welding helmet features an optical index of 1/1/1/1. When you look through the lens, you don't see any refractions when lights cross through the filter. It provides better colour consistency at different points of the lens. The shade stays constant regardless of the viewing angle. Changing the lens is a tad inconvenient. TACKLIFE PAH04 isn't short on features nor does it disappoint in their execution. But, first and foremost, the model is defined by its exceptional performance, a great reaction time of the lens, and a large viewing screen (98 x 43mm) that provides a broader view in all sorts of welding operations. The kit comes complete with everything you need for consistently efficient operation without any hassle. Interchangeable lenses, a removable sweatband, and a convenient storage bag are really nice bonuses. The mask is rather heavy. The Leopard LEO-WH86BK welding mask will deliver a reliable protection against harmful radiation, melted metal particles, and excess heat exposure. A grinding mode allows using this model for grinding projects. It's a really helpful option for preliminary and post-welding surface processing. The helmet is available in more than 10 designs. A pretty large view area of 100 x 53 mm will provide a maximum wide viewing area. So, you'll be able to work without any inconveniences. Meanwhile, an additional battery will let you work even under low-light conditions. The band adjustment is a bit inconvenient. The Expert Weld XWH11 is a highly functional and reliable helmet that will definitely add to your welding gear arsenal. 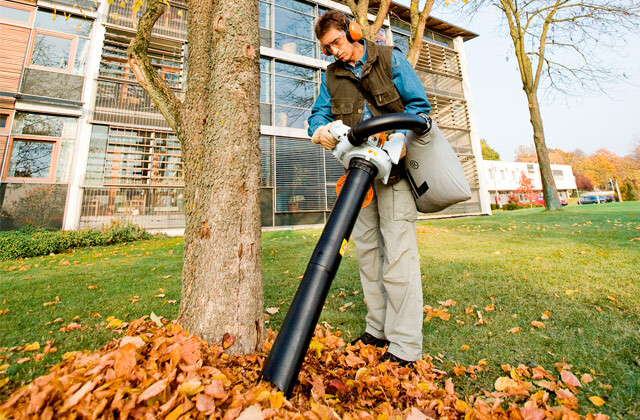 Distinguished by well-thought ergonomics, it offers every comfort needed for long-term work. The model is available in four bold rock-style designs. The Silverline welding helmet has a shockproof durable shell which is not susceptible to high temperatures and is highly resistant to various mechanical impacts. There is no auto-darkening function. The Silverline welding helmet fully meets all current requirements and standards for this type of gear. Despite its simple passive design, the model is very convenient in use and suitable for a variety of welding jobs including MIG, TIG & Arc (MMA / GMAW) welding. Backed up by over than 100 years of experience, ESAB is a true leader in the market of welding and cutting equipment and consumables. 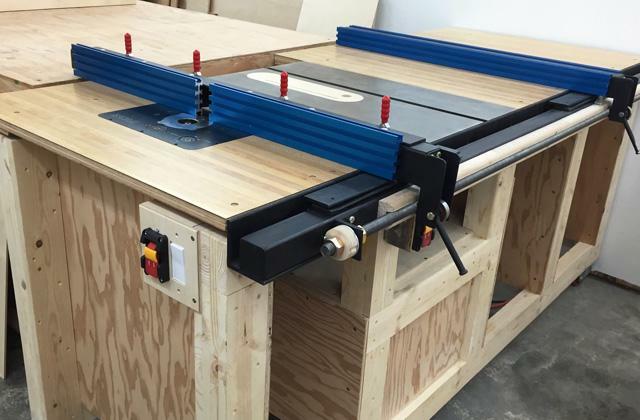 Cleverly fitting its products with innovations and helpful technologies, the manufacturer always offers high-quality equipment and gear meeting the needs of a variety of specialists. 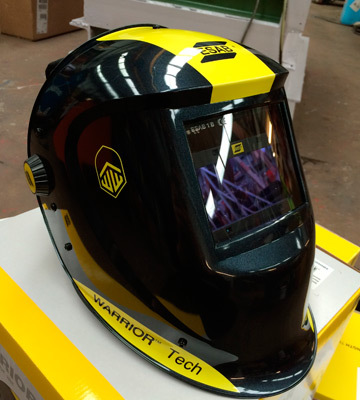 The Warrior Tech welding helmet is not an exception. It's an auto-darkening welding mask that will automatically adjust the lens shade depending on whether welding is in progress or not. Since the model is intended for different types of welding jobs including MIG, TIG, and MMA welding, the shade level will vary from 9 DIN to 13 DIN. 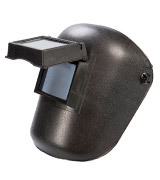 Equipped with a first-class optical welding lens, the helmet provides a maximum level of ultraviolet and infrared radiation protection while a high-tech lightweight shell will securely protect you from high temperatures, sparks, and splashes. Along with functional versatility and the ultimate operation safety, the Warrior Tech offers every convenience you'd expect from this type of protective equipment. 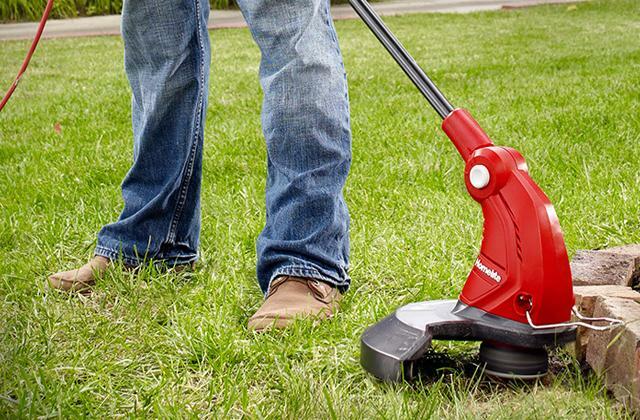 An ergonomic design with an angled front pad, 3 longitudinal adjustments, 5-point rake, and adjustable push ratchet provide superior comfort for continuous work during long periods of time. The newest ADF technology will let you enjoy the exceptional clarity of vision while a wider field of vision ensures larger viewing area for improved performance. 4 arc sensors enhance the auto-darkening filter sensitivity to avoid blind spots during low-amperage welding. In addition, you can adjust the delay time to align the darkening disengagement with the job at hand. 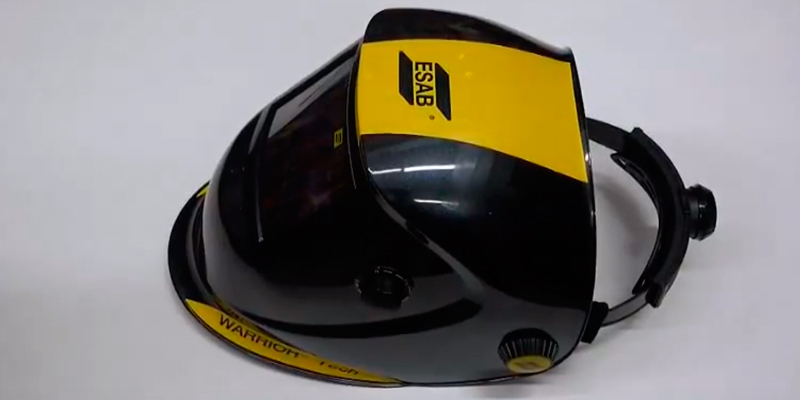 Functional and reliable, the ESAB welding helmet is a great choice for both occasional domestic welders, maintenance workers, and professional welders. With the TACKLIFE PAH04, it is as much about the number of notable features as it is about their execution. For example, most welding helmets come equipped with an auto-darkening lens. But those helmets seldom incorporate an optical index of 1/1/1/1. And it is a real shame since it offers much clearer vision compared to standard welding helmets with a standard grade of the optical index (usually 1/1/1/2 or lower). What we like the most about this model is probably that first "1" that stands for outstanding diffusion of light. When you look through the lens, you don't see any refractions when lights happen to cross through the filter. 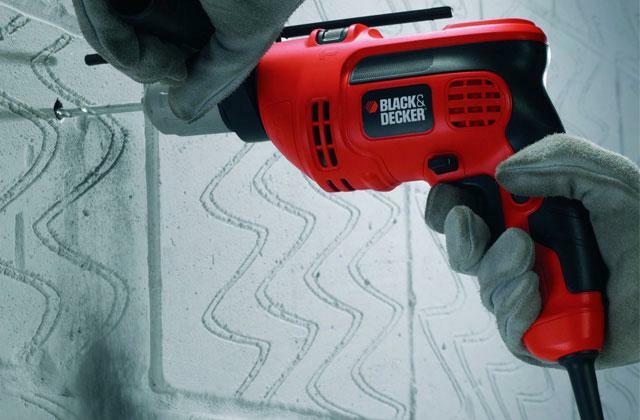 As you'd imagine, it helps with precision as well as safety. Of course, the variation of light transmission isn't unimportant either. An inconsistent hue could easily affect optical clarity, making the viewing area far too bright or too dark. Fortunately, the model offers better colour consistency at different points of the lens, improving visibility and making it more consistent. Speaking of which, class 1 of the angle dependence grade implies that the shade doesn't darken when you look through the lens at different angles. Instead, it stays constant regardless of the viewing angle. Aside from performance, it is also the little things. 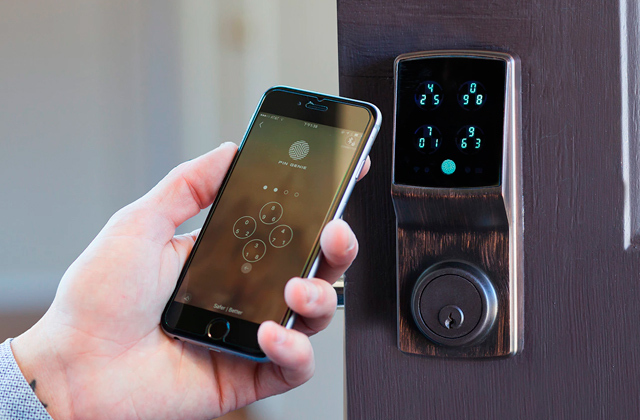 For instance, the adjustable knob makes it easy to change the shade and sensitivity. Plus, it is slightly raised, making it a bit more convenient when used with gloves. The adjustable headband ensures a nice no-slip fit. The contoured frame edges work wonders deflecting particles and splashes. In short, the TACKLIFE PAH04 isn't short on features nor does it disappoint in their execution. But, first and foremost, the model is defined by its exceptional performance, great reaction time of the lens, and a large viewing screen (98 x 43mm) that provides a broader view in all sorts of welding operations. When choosing a welding helmet for regular extensive use, any welder will intuitively select between the models made of high-quality materials and packed with useful features facilitating the welding job and enhancing the work efficiency. In most cases, these are premium welding masks from leading manufacturers that are commonly pretty expensive. Think it’s the only possible solution? The Leopard LEO-WH86 will prove you the contrary. This automatic welding mask offers functions and features of premium models at an affordable price tag. See for yourself. Just like top models, the LEO-WG86 provides the highest level of user safety and protection. Made of strong and durable heat-resistant and impact-proof plastic, the helmet shell will provide the overall protection for your head, face, and neck from welding sparks and splashes and look brand new even after years of use. Meanwhile, an auto-dimming lens will securely protect your eyes from harmful UV rays once the welding arc occurs. And owing to an adjustable headband along with a removable and washable sweatband, you can customize the helmet for your convenience. A streamlined mask shape leaves sufficient space for a proper air circulation making the fumes released during welding flow smoothly around the mask without getting inside. large viewing screen of 99 x 44 mm adding comfort and convenience to efficiently perform any kind of welding jobs. As a pleasant bonus, the Leopard welding helmet is available in more than 10 bright and eye-catching designs including rock-style patterns and abstract image for you to choose the one to your liking. 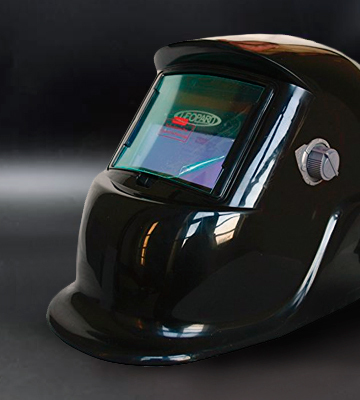 With the Leopard welding face mask, you’ll get premium functionality at the fraction of the cost of more expensive top-rated models. 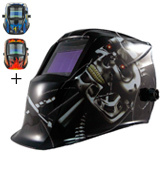 Welding helmets reacting to changing welding conditions are becoming more and more popular today. Offering similar basic functions, the manufacturers of different brands strive to attract customers with some extras. 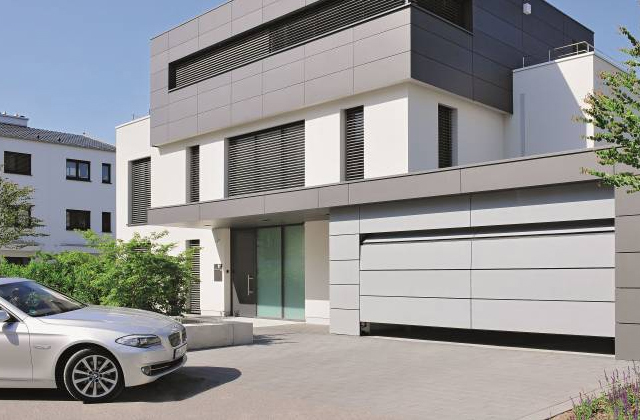 And one of such -additional selling points is an appealing or extraordinary design. This is exactly the strategy the Expert Weld has chosen for its series of auto-darkening welding helmets. The set of features common for this type of welding masks includes a so-called "chameleon" technology or auto-darkening filter that automatically switches the lens shade from transparent to dark and back in less than a second and an adjustable sensitivity option along with a delay-time function to customize shading settings for different types of welding jobs. Thanks to a padded headband, the helmet will comfortably and securely sit on your head. Besides, the headband diameter can be adjusted for convenient and safe work in different positions. As for the material, the helmet shell is made of highly durable refractory plastic that can easily withstand high temperatures and is shock-proof. All of this not only greatly improves your work efficiency but also provides the ultimate protection you need for such a dangerous job as welding. 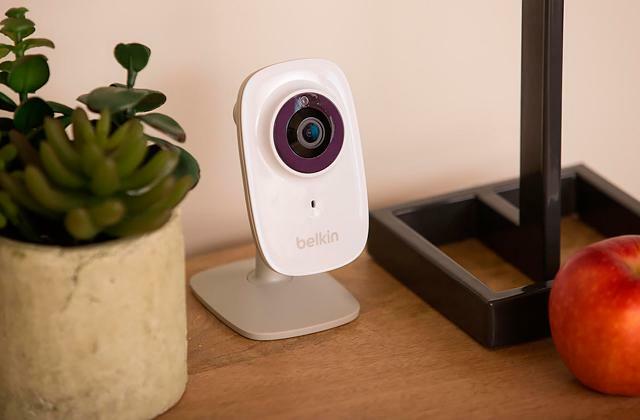 The lens is powered by a built-in solar battery saving you the need to buy replacement batteries. However, for the work in low light conditions, the package includes an additional lithium battery. Yet, what will strike you most about this model is a variety of bold and stylish design patterns, from eagles and metal skulls to fiery bikers, flame tails and to abstract ornaments like those you can come in tattoos. All images are printed against contrast dark and bright backgrounds. Hence, there is a pattern for any, even the most demanding, taste. If you are looking for a dependable and stylish protective gear for a variety of heavy-duty welding jobs, the Expert Weld welding face mask is what you need. With the introduction of auto-darkening welding masks, passive welding helmets might seem something outdated or even a kind of obsolete today. Yet, if you need an affordable and truly reliable solution for occasional welding jobs, a passive welding helmet is a great option to go for. Just like the one from a renowned Silverline brand. Though it features no automatic dimming technology and has a lens with a fixed shade level, the Silverline 858520 welder’s helmet provides a due level of protection for different welding jobs. 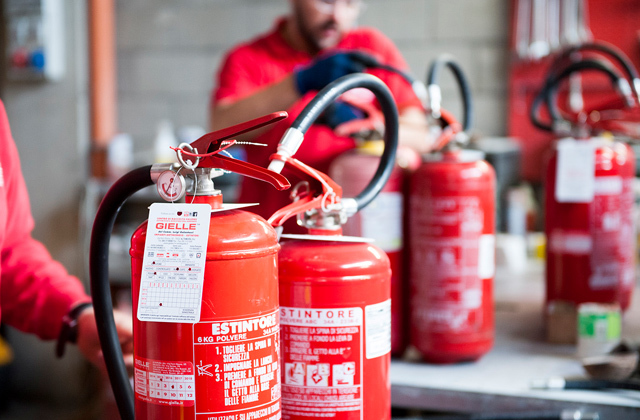 The model boasts a shockproof durable shield which is not susceptible to high temperatures and is highly resistant to various mechanical impacts securely protecting your face, head, and neck from sparks and melted metal splashes. The lens is made of heat-resistant high-quality mineral glass with the shade of the rating of 11 DIN that is high enough for a range of high-amperage welding jobs, to say nothing of low-amperage welding. 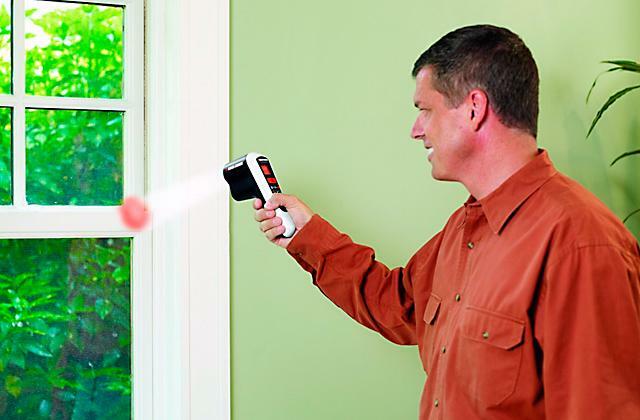 A light filter will protect your eyes from harmful radiation. Similar to modern auto-darkening helmets, the Silverline offers hands-free operation, thanks to an adjustable headband comfortably fixing the shield on your head. And you will definitely appreciate a lightweight design of this model. With the weight of only 440 g, it’s one of the lightest welding masks in its class that will not cause any discomfort or neck fatigue during work. A flip-up lens will provide improved visibility when the ignition arc is turned off and you need to check the quality of welds. Distinguished by a simple yet functional design, the Silverline welding face mask is a really good choice for domestic welding projects and occasional welding jobs. What Is a Welding Helmet? Any welder knows for sure that a welding helmet, or a welding mask, is a principal protection for performing any welding job. 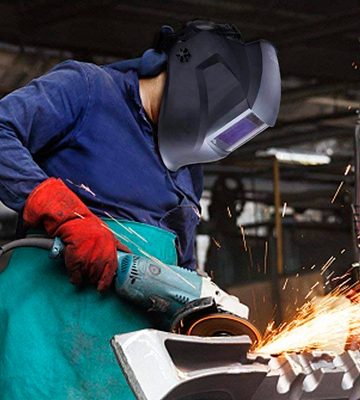 Firstly, the helmet can guard your sight against the bright light of the welding arc. Secondly, it protects your hair and scalp from sparks and splashes of hot metal. Currently, helmets are available in two types: passive and auto-darkening models. No matter which one you choose, you'll be protected from dazzling light and harmful UV and IR radiation. The major difference lies in the field of application and comfort of use. 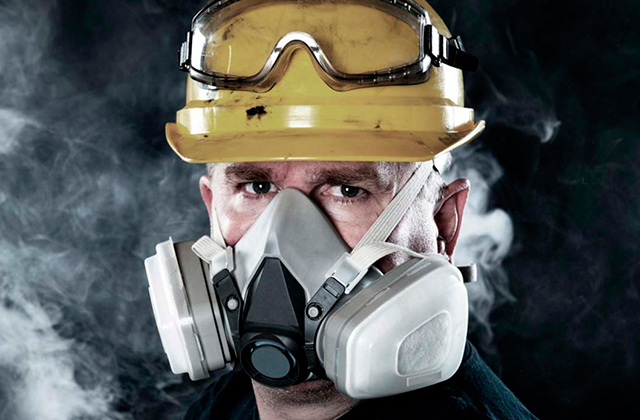 Professionals all over the world use welding helmets to save their health. 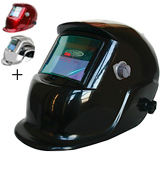 In this review, we will cover 5 best welding helmets for you to find the suitable one. If you are just getting started in welding, we recommend choosing one of the easy-to-use MIG welders for your household projects. 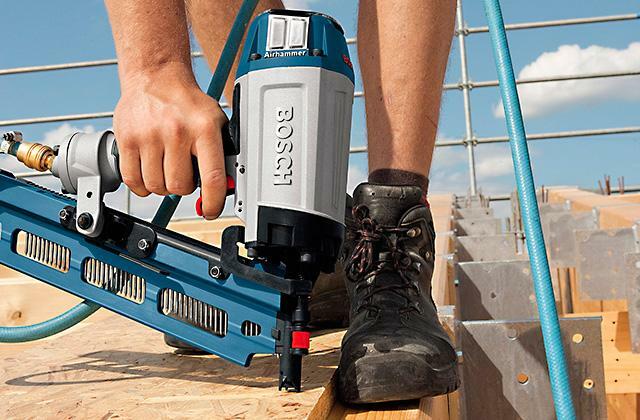 To make your welds neater and tighter, pick an angle grinder which will help you debur and cut structural elements and materials. Lastly, you can skim through our review of plasma cutters if you need a tool for a quick and precision cutting through all types of metal. Let's start with passive helmets, the tools which have been used in the welding industry for decades. A passive helmet features a tinted viewing lens with a fixed shade, providing the constant level of protection to the wearer. Using a passive helmet, the welder has to flip the visor up to insert an electrode or torch and then flip it down before striking the arc. 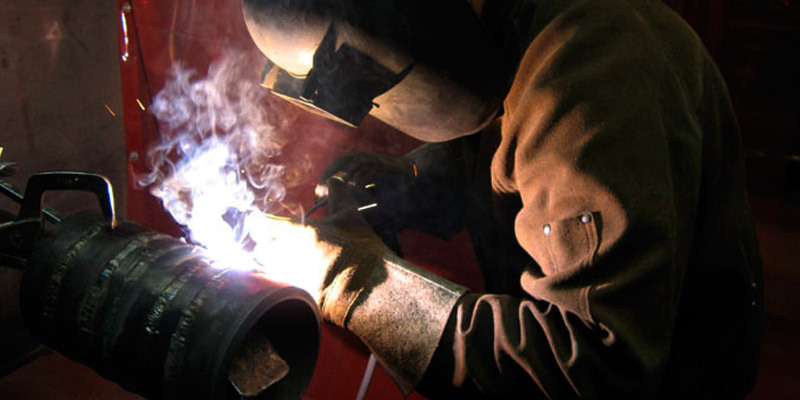 To check the weld, the welding operator needs to raise the helmet visor and lower it to continue welding. 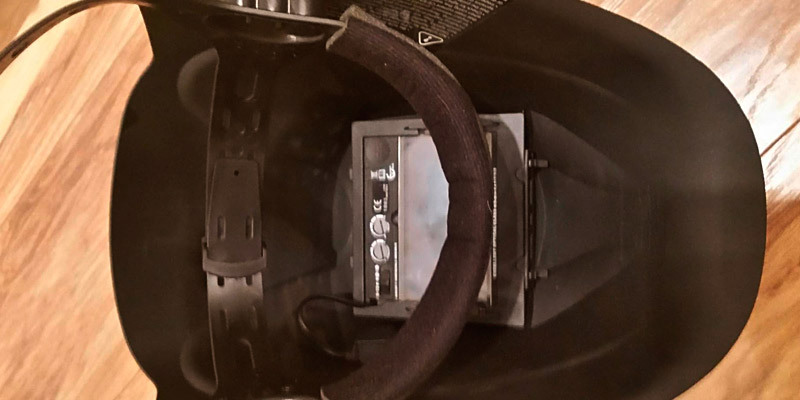 This distracting procedure was an inalienable part of every welding job until 1981 when Speedglass launched the production of the helmets equipped with light sensors and variable shade lenses, known as auto-darkening, or variable-shade helmets. 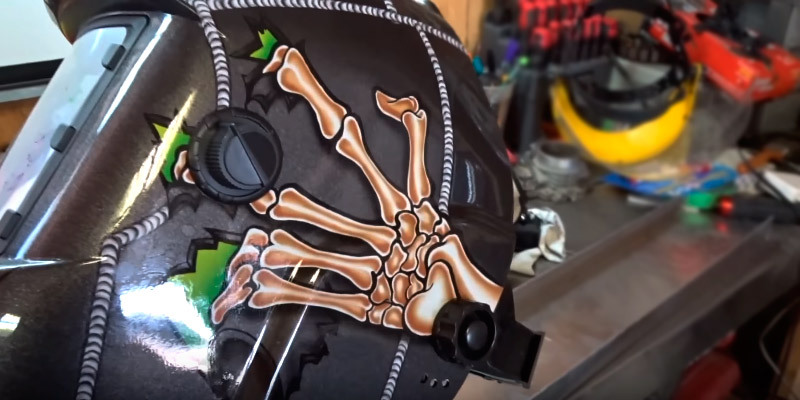 An auto-darkening helmet keeps the lens fully transparent when the welding is not in progress and automatically applies a dark filter to the lens using built-in sensors once the arc is stricken. Thus, the welding operator does not have to open the helmet visor and can focus on the job, hence doing it faster and better. As a power supply for their operation, auto-darkening helmets use solar cells or replaceable batteries. In case you are thinking of choosing one of the passive helmets, mind that they are equipped with fixed shade lens, therefore you'll need to pick one in accordance with the type of welding jobs you're going to perform. Also, keep in mind the specific lens shade level for the helmet lens, which is measured according to DIN specification. Thus, the helmet with the lens shade of up to DIN 8 is fit for low-amperage welding, for instance, TIG welding, while helmets with lens shade ranging from DIN 9 to 13 are preferable for projects with higher power input. When it comes to auto-darkening models, they are a bit more tricky. You have to consider the lens filter activation speed, or reaction time, which means how long it takes for the system to darken the lens once it detects the arc striking. The entry-level helmets switch lens at 1/10,000 second, while professional-grade models are rated at 1/25,000 second and quicker. Some of the variable-shade helmets also offer a delay parameter, which stands for the time between the moment the system detects an arc absence and the moment it starts to switch the lens from darkened to transparent. The delay is usually adjustable and is set in milliseconds to shield the welder's eyes in case a fresh weld bead continues to emit bright light after the arc is gone. Still, the coolest thing most auto-darkening helmets deliver is a variable shade that enables a user to choose a suitable tint without swapping the lens. 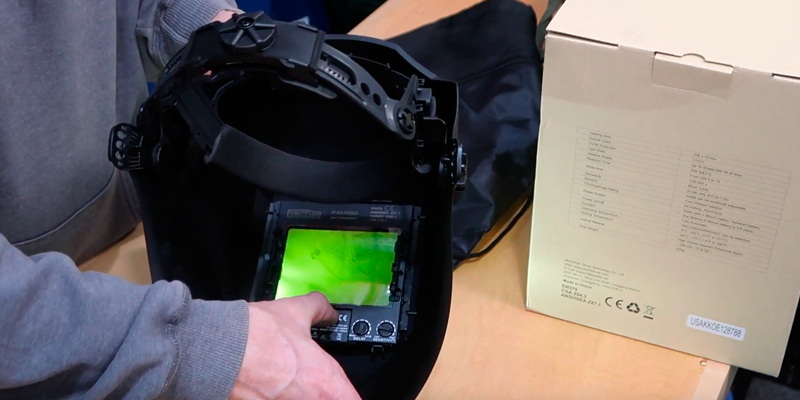 Some auto-darkening helmets feature the sensors with sensitivity control for a better response to the arc. The sensitivity refers to the amount of light needed to trigger the lens, with that, a high sensitivity is appropriate for sunlit or brightly illuminated workplaces, while lower settings are better for dim and dark surroundings. An advantage of passive helmets is that they don't need a power source, which makes them handy. 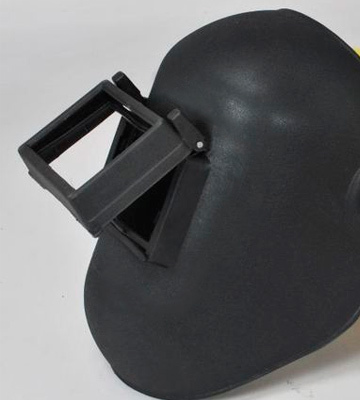 Working with a passive helmet, you don't have to think about battery discharging and interruptions in welding. Although, most variable-shade helmets are fitted with solar cells with battery backup that ensure a long runtime as well. The helmet weight and size are important for its comfortable use, whatever helmet you choose. A heavy and/or oversized helmet will hardly make it easier to do the welding for hours, so give attention to size and weight of the model you're going to buy. Also, it's reasonable to consider the helmet supply package. Variable-shade helmets might come with batteries for instant operation and some models can be supplied with a bandana, gloves, or a bag for comfortable use. Q: How can I check auto-darkening helmet to make sure it works? A: Your helmet should have the test button that allows checking whether it is in working condition. Push this button and if your helmet is OK, its lens will darken even when it detects no arc. Should the lens fail to dim, make sure that the batteries are installed properly and are not depleted. If they are not, put the batteries in and test the helmet again. If helmet still doesn't work, it may be inoperable and require professional maintenance. Q: How to set the helmet right? A: First, adjust the lens shade with the corresponding control and set the darkest shade recommended for the type of a welding operation you're going to perform. Set the lens delay time you feel comfortable with so as to avoid eye flashing. Once you ensured that the lens is tailored to your needs, put the helmet on and adjust the headgear for a comfortable fit. Position the helmet so that you could see through the viewing screen clearly without any obstacles. There you go! Q: Which lens shade should I choose for welding? A: Set the shade according to the type of welding you perform. The Occupational Safety and Health Administration (OSHA) regulation 1910.133 comprises a guide for choosing the proper lens shades based on various applications. OSHA recommends starting with a shade that is too dim to see the weld area, then switch to a lighter shade that provides a sufficient view of the weld. Don't set the shade level below a minimum recommended value. Q: Should I maintain my helmet in any way? A: Yes, you should do it on a regular basis. Q: How can I take care of my helmet? A: The helmet lens is prone to clogging with dust, so clean it thoroughly so that you can see clearly while using it. Remove dust from the lens with a soft brush and rinse it with water or lens solution, then wipe it down with a soft tissue and let it dry. Please note that the protective layers of the lens are pretty delicate, hence clean them gently. It is advisable to wipe the lens out right after each use. Also, it's nice to have a few replacement lenses as the viewing screen might get scraped or broken, especially in harsh working conditions. Lenses are sold in packs of 5 or more, so get one for yourself. 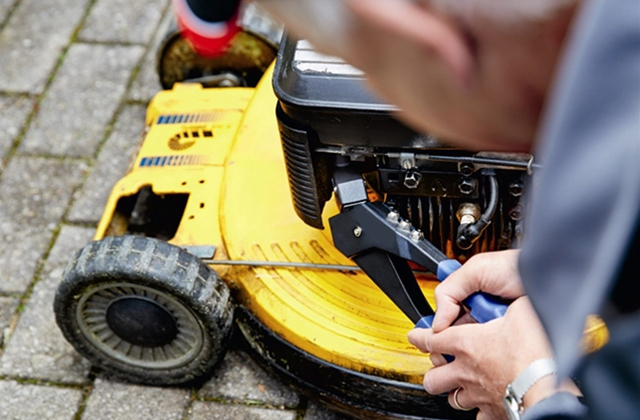 Finally, keep replacement batteries at hand as you hardly want to end up with interrupting the job because of rendering your helmet inactive. Q: How to store a welding helmet? A: Keep the helmet away from areas that involve movement to prevent it from bumping. Store it in a dark room with low humidity, preferably in the original packaging. Q: Should I protect my helmet when carrying or transporting? A: Yes. If your helmet comes with a bag or case, put it in there to keep the lens from getting scratched. 1. 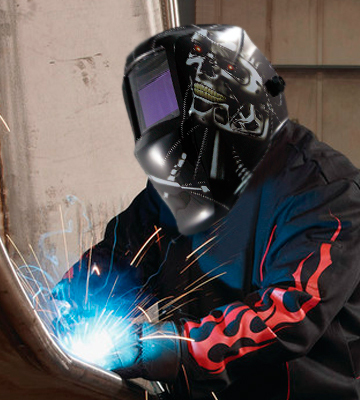 Choose the Right Welding Helmet for the Job, Grainger. 2. Jamy Bulan Choosing a Welding Helmet, Lincoln Electric. 3. Selecting the Right Welding Helmet For You, Miller Electric. 4. Lauren Piek Choosing a Welding Helmet, Blain's Farm and Fleet. January 22, 2016. 5. Welding Helmets and Eye Protection, Lincoln Electric. 6. Welding helmet, Wikipedia. April 10, 2017. 7. What are Welding Helmets? wiseGEEK.